We are also urging solidarity actions on August 7. However, we note that Colombian embassies and consulates will be closed on August 7, and that some organizers are considering events at consulates for alternative days. 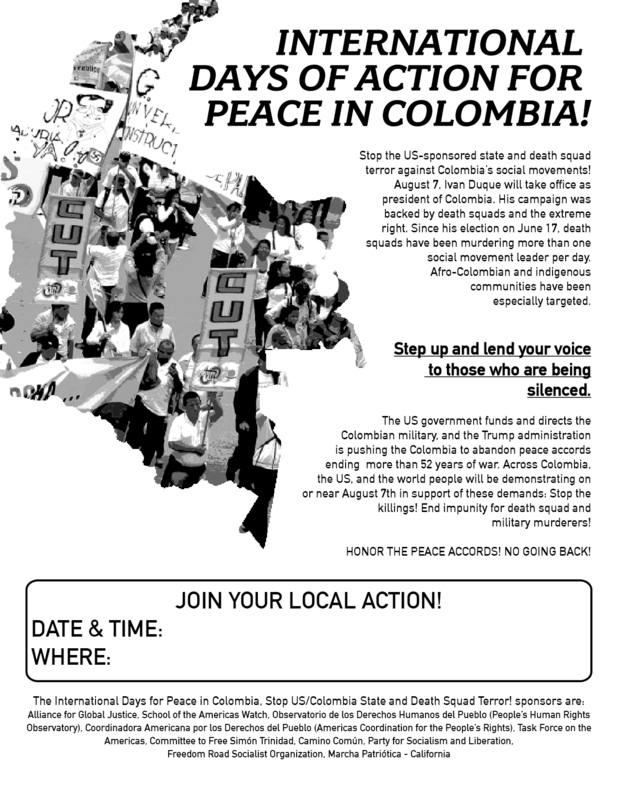 IF YOU ARE PLANNING A MEETING WITH COLOMBIAN EMBASSY OR CONSULATE PERSONNEL – Please take them a copy of the Five Demands for Peace in Colombia open letter signed by Noam Chomsky, Nobel Peace Prize Winner Adolfo Pérez Esquivel, and former Colombian Senator Piedad Córdoba. This link will take you to the English version.